An incomplete Medieval - Post Medieval lead token, dating AD1300-1800. Powell Type 1. 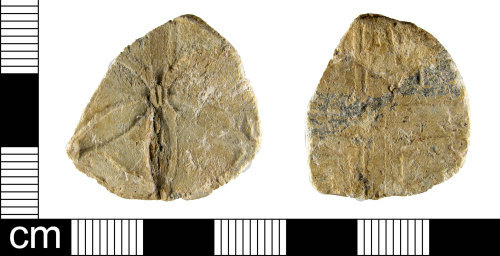 The token is circular in shape and biface. One side is decorated with a six petaled flower. The other has a cross with each arm formed of four lines. The token is covered in a light grey patina. Dimensions: diameter: 25.86 mm; thickness: 3.25 mm; weight: 8.19g.